Since my children were very small we have made it a habit to spend as much time outside as possible, but it’s not always easy. Our schedules are hectic and technology is such that most of us hardly even think about going outside. It seems our attention is either on our computers, our phones, or the television when we are home. Our children’s health and our health as a country is deteriorating and we really need to start making it a habit to spend more time out-of-doors as a family. Here are few ideas that for getting your kids outside that have worked for me. 1. Play Outside Every Day When my kids were small, we made a point of playing in the yard every day. We would swing, play catch, or they would ride around the driveway on their tricycles or get some sidewalk chalk and do some art work. I even taught them the art of making mud pies which was one of my favorite pastimes when I was small. Momma would set me on a towel and we would dig up some dirt, mix it with water, and make pretend pies in mom’s old pie tins. Sometimes we had an old box that we used as an oven and baked our pies for supper. Momma was always thinking of ways to get us involved in outdoor activities and since I loved to help her in the kitchen she knew I would enjoy this activity. Every year we would plant a garden and momma would let us pick out one vegetable we wanted to grow. It was so much fun planting and watering our vegetable and even more fun when it grew and started producing. It is a wondrous thing for a young child to watch plants as they grow. Even if you have never gardened, it is still something you and your kids can have fun learning together. I will never forget my first vegetable, which was corn; I planted it and watched it grow so tall and strong. There is nothing like eating something that you grew yourself. My children wanted to grow their own trees so that is what we started with. We planted a peach, pear and a kumquat tree and the children were so thrilled when their trees started to fruit. This takes a bit longer than a vegetable garden but it is very rewarding when the trees fruit and you actually get to taste it. Many days when my kids get home from school and have a quick snack we take a walk or ride our bikes. 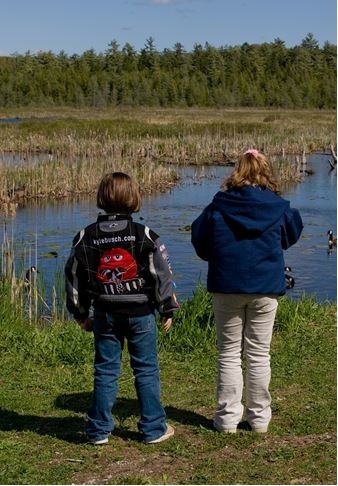 After school is a great time to get into the habit of going outdoors before everyone gets settled in front of video games, television, or computers. We either walk or ride to the local park or to the bayou to look for tadpoles. My children love to hike and look for interesting leaves, rocks, plants, moss, and trees. My mom bought my son a small blunt axe so he could chop up the dead logs we found. He really thought he was all grown up using that axe. We’d bring home our finds and use them for craft projects later. I also found that doing craft projects outside makes it easier when it is time to clean up as well. Doing things as a family is the easiest way to get your children active and outdoors, when the kids see mom and dad getting out and having fun it makes it fun for them as well. If it becomes a lifestyle for the entire family then it usually becomes a lifestyle that sticks. We have a badminton net set up in the yard, and even though my daughter sometimes doesn’t want to play, she always has a great time after she gets going. I have found that even less active children can get excited about being active if the adult with them makes it fun. Just being out-of-doors in the sunshine is a step in the right direction. Going camping was a new adventure for me when my kids were young, I was a little hesitant, but I knew that my children would love it. We started out camping in the back yard. After that my kids wanted to go to a real camping park. There are so many state parks around the country so it is easy to find one not too far away. Most state parks have lakes for swimming and fishing and trails for hiking. Plus, they are safe for families. I remember the first park we went to in Texas. We were setting up camp and my son wanted to go see the lake so I let my daughter take him. Within a few minutes, they were back and my daughter had a panicked look on her face. She told me that there were alligators on the banks of the lake! We talked to the rangers and they assured us that if we did not mess with the alligators they would not mess with us. I was just glad we did not pick one of the campsites that were on the bank of the lake! It was such an adventure for the kids to sleep in a tent. We saw so much wildlife that we would not have seen at home. We learned quickly that you cannot leave food outside or inside the tent. One night a bag of cookies got inside the tent and was up underneath a sleeping bag near the edge of the tent – but no one knew how, of course. All night long something was scratching at the tent, even after I ran outside and tried to scare it off. In the morning we had a tiny hole in the tent and found the cookies. The next night we made sure there was no food in the tent and we had a better night sleep! The whole family benefits from getting into the habit of getting active outside. I have found that it really clears the mind and helps the attitude when we all get off of the technology and do something active. Rachel is an ex-babysitting pro as well as a professional writer and blogger. She is a graduate from Iowa State University and writes for www.babysitting.net. She welcomes questions/comments at rachelthomas.author@gmail.com.